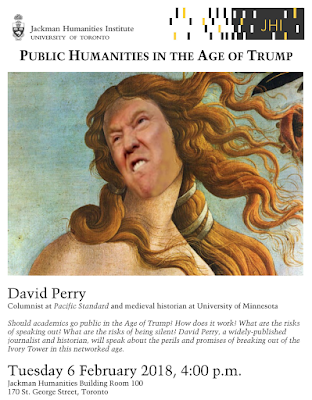 Today at the Jackman Humanities Institute at the University of Toronto I will be giving a talk on Public Humanities in the Age of Trump. Details here. 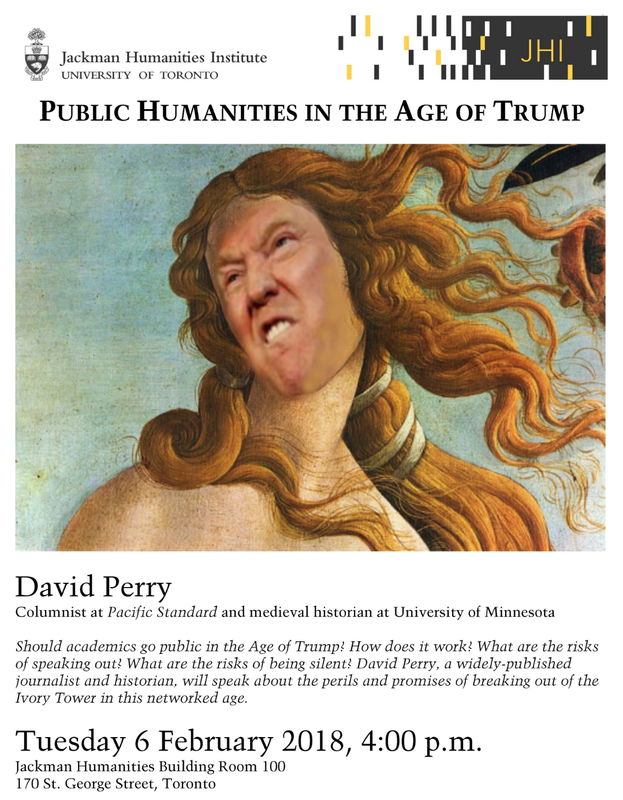 It's been an intense period lately around right-wing attacks on academic freedom, not the least because I've encountered the worst sets of attacks of my career. They were exhausting, if never actually professionally or personally threatening (a factor of my privilege). Moreover, they have only firmed my resolve that "sustained activity based on scholarly expertise aimed at least in part at extramural audiences" is important. I include my bolded definition here because we need to make our ideas about publicly facing scholarship much broader. It's not just writing essays, but "sustained activity." That includes community art and theater, teaching in prisons, and, yes, activism and protest. And then we need to count it for tenure, promotion, hiring, and grants. Poster below. I love it. See you in Toronto.